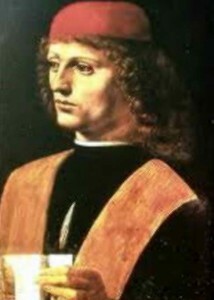 Giovanni Pico della Mirandolla – Italian representative early humanism era Renaissance. All of Europe believes Giovanni most educated man of the Renaissance. The philosopher was incarnation the high aspirations humanism. Pico studied issues man’s place in the world, ways to achieve truth the philosophical attitude to wealth studied philosophy different master, would describe all the secret different countries, investigated content book of Life, substantiated human freedom, which creates own “I”; the basic idea – comparisons of rights to unearthly. Using their doctrine and doctrine Plato – Pico della Mirandola launched his philosophical system, which is implemented in the works «Philosophical, Cabalistiс and theological conclusions», which consists from 900 theses. Philosophy Pico – eternal philosophy, it was called Chairman of Concord, for the purpose of it all life was philosophical world, where there is consent views, where there are no disputes, where all live under uniform rules. Therefore he always had discuss, defend their, he believed, the only correct view from representatives of the church. His vision integrity opinion and world laid out in labor «900 theses», written by in 23 years. Here he successfully combined medieval and ancient philosophy. A significant soil his philosophy «general agreement» believes Kabbala – Jewish teachings learning mystical. According to Pico, going through, who preaches Kabbala, one may grasp the mind of Christ, so this learning is akin to Christianity. As you know Kabbala based on sanctity language, this learning proves, in the language available 10 names of God, which together give a name. Letters davnoevropeyskoy language in appropriate location arranged in 10 words, revealing the mystery of God’s creation of the world. These ten words also enable understand space. In Kabbala mentioned names angels, not found in the Bible. These angels, by Kabbalistic learning, has various properties, help influence people. Вelieved, if the person is art combination of numbers, described іn Kabbala, learn to call angels, can have magical. Pico believed Kabbalа, believed, that mastering learning, can affect the course of events, the views, the desire. From the words of Pico – every person is in place, which God gave her (God allowed man to become the creator of destiny). Man can herself create its nature, as it wants conscience. In the literal sense- person creates herself in life. Thus, a person – host of his life. God allowed man to become the creator destiny. This meant a person is decent creature, which can achieve supernatural happiness. In addition, people is free to think and implement creative possibilities. We can say that to person included all components nature. Pico teaches understand and distinguish good and evil. Nationalist gave a prominent role philosophy in shaping personality. It is important that man made the right choice way of life, that sought to highest and has a basis culture and education. Philosophy has essential the formation of the inner world. Learning Pico of people, its freedom of choice become great achievement humane philosophy. In Giovanni’s ethics anthropocentrism begins to develop, person figures in constant struggle between black and light forces. Pico managed to concisely and clearly describe general ideas of humanistic outlook of Western European culture which then began to emerge. Pico’s learning become combination of ancient and medieval thought, which is an indicator Renaissance that stems from past eras of culture, although inherits many new interesting features. Analyzing the philosophy of Pico, You can see the dual nature. His works characterized rapid change in the natural characters in his learning’s intricately intertwined philosophical thoughts of his predecessors According to philosopher there should be own view of the world, own relation to reality, which is not observed on the one theory. Pico paid great value for concept of Love and Beauty. It is no accident that historians called him the representation of aesthetic ideals of Renaissance. Almost every book on aesthetics contains a reference to philosopher. love was believed as a top of intellectual contemplation in the first major work “Comment on canzone of love”. Love permeates all the world because it is created by God, and God is love. Pico does not give God beauty because it is simple and perfect. The concept of beauty includes some imperfection. Philosopher distributes beauty and love into two types – common and Celestial. This entry was posted in Ethical and tagged Ethics, Mirandola on 24/09/2016 by Mary. I always struggle as well as I just finish up looking vacant display for very long time.